The Walking Netball programme; developed through an exciting partnership between The NFWI and England Netball, has now officially launched. April saw the first WIs signed up to the programme begin sessions with specially trained Walking Netball Hosts. Lapwings WI were one of the first WIs to play Walking Netball and have been enjoying the sport since last year. 41% of carers said that ‘all or most of the time’ hospital staff did not meet their loved one’s care needs in relation to their dementia, and a further 36% said they were only met some of the time. During their hospital stay, 37% of dementia patients were reported to have lost weight, 27% became dehydrated and 15% became malnourished. 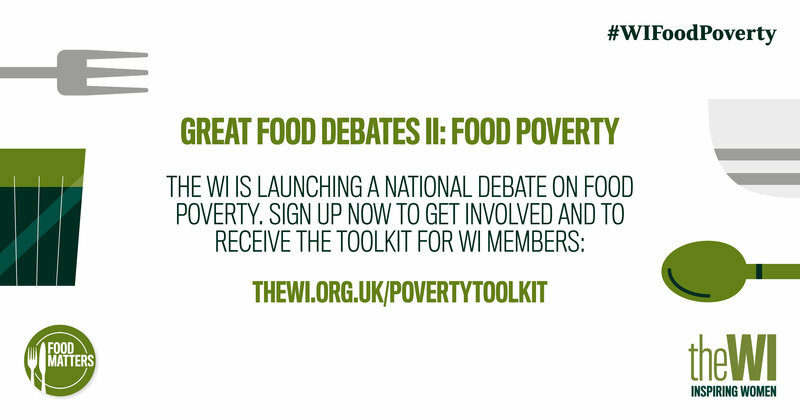 The NFWI (National Federation of Women’s Institutes) is launching a national debate on food poverty, with WI members across the country organising local events to look into how the issue affects people in their communities and nationally. The WI has a long history of campaigning on food. The supply of food to the war-torn nation was central to the early activities of the 103-year-old organisation, and since then the challenges of ensuring a sustainable food supply, tackling poverty and protecting the environment have remained close to WI members’ hearts. 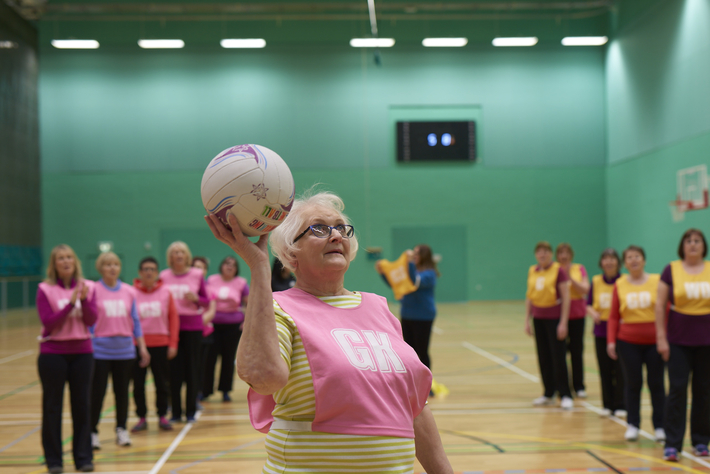 England Netball and The NFWI are delighted to announce a partnership that will see Walking Netball sessions provided to WIs across the country. An open application period saw over 200 WIs express an interest in being part of this exciting project. Walking Netball is a slower version of the game; it is netball, but at a walking pace. The game has been designed so that anyone can play regardless of age or fitness level. Dangerously low staffing levels mean that half of women (50%) experience at least one red-flag event during childbirth, according to a new report from the National Federation of Women’s Institutes (NFWI) and NCT today. According to The National Institute for Health and Care Excellence (NICE), “red flag events” are signs that there may not be enough midwives available to give women and babies the care they need, for example having to wait more than 30 minutes to get pain relief or over an hour to be given stitches. "INSPIRING WOMEN" With these words alongside our new logo we hope to encourage women to join WIs nationally and in particular our small but beautifully appointed Women's Institute in Cornworthy! We are very much a community-based organisation involving ourselves in the life and social events of the village - an integral part of the rural life here. Our monthly meeting is held on the 3rd Tuesday in the month at 2.15 p.m. at The Sportsman's Arms, Hemborough Post, Dartmouth. Although our group numbers only 25 there is usually a good and enthusiastic turnout for a range of talks, films, cookery demonstrations and, sometimes, musical entertainment! .There is always a wide range of activities and outings which we can attend, including a bi-monthly luncheon club which also meets at The Sportsman's Arms. There are two Council Meetings a year at different locations in Devon which update members on the WI locally and nationally. These are inspiring occasions with opportunities to meet and network with other groups. Celebrities are invited to speak on a range of subjects. There are various offshoot activities within our WI such as the Book Club, Craft Group and organised walks. This year has seen members attend Exeter College for a beauty & pampering day, a sunny afternoon was spent trying to play croquet & enjoying an excellent cream tea provide by one of the members. Last month quite a few ladies went on a county trip to Wells & the Bishop's Palace. The year will be rounded off with Christmas Lunch at Sharphams in the great hall – an experience not to be missed. Cornworthy WI has been an essential part of this community for 25 years, contributing, supporting and engaging with each other in a warm and welcoming environment. Anyone interested in joining is welcome to attend a meeting. Our list of meetings appear on the WI notice board (just below Island House) and will soon be on this web-page - stay tuned ! Please enter below, the characters from the image above.